The Versalab archival print washer is a reliable robust product for professional darkroom use. It will very effectively wash prints with a moderate flow of water and it should do so almost forever since it is nearly indestructible. There are no better print washers! Print washing is a fundamentally very simple process - surround the print with flowing water, that is all it takes. So we saw that it was possible to build a product that was simple and well made, designed as if for the chemical process industry, and then give it an appropriate price. The tank is a one piece 1/4" thick polyethylene molding with generous radii in the corners for easy cleaning. This tank is leakproof and so damage resistant the entire washer could be thrown across the room and still be picked up and used (you might not even notice any damage). This product is so strong that we regularly tip the full (or nearly full) tank over in the sink to quickly drain it. The dividers are fastened together in a lift-out 'print basket'. The basket has 14 slots 3/4" wide and is constructed of fifteen 1/16" thick sheets of white styrene fixed into the basket arrangement by 4 stainless steel studs with spacers. Prints are held off the bottom of the washer by 4 plastic rods that are part of the basket. The basket can be lifted out of the tank at any time. 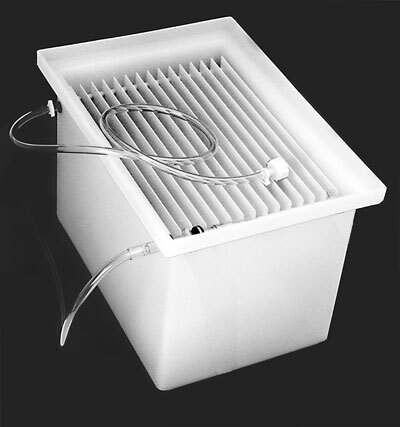 Water flows into the tank through a tubular plastic underwater spray bar which has a separate jet for each slot in the basket. The jets are angled such that they create a recirculating flow pattern within the tank. Turn the water supply up high to fill the tank. As the water nears the flanged area at the top of the tank, reduce the water flow rate until the siphon break hole murmurs continuously. The washer is ready for use. Note: While our washer has been designed for use outside a sink, we do not recommend any running water being left unattended while outside a waterproof area. It isn't possible to categorically state how fast any washer will achieve an archival wash under your processing conditions and chemistry. The only way to know is to test using HT-2 (which is simpler than you think). For the 11 x 14 model, with proper care and clean preparation, a good wash can be possible in less than 1/2 an hour at less than 1/2 gallon per minute water flow. Different fixers, less care in fixing and different water chemistry may require double the time. As described above our washers have a "print basket" which is a separate assembly that sits in the tank of the washer to hold prints in the proper position. The 20x24 adapter is a replacement print basket for the 16 x20 model only. It has four slots and holds four 20 x 24 prints in a "U" shape (quite large radius and perfectly harmless) emulsion side in (great wash that way). How does the Versalab archival print washer compare to other washers as far as water flow is concerned? A fascinating question. The issue of water use seems to have become something of a decision point in the choice of archival washer purchase, and we think that this is marketing nonsense not logic or science. There are several parts to the answer. Firstly, any well designed washer will have nearly the same real water flow requirement and wash time. The total amount of water necessary to adequately dilute print-borne fixer is not very great. The capacity of our washer is nearly enough dilution water by itself without additional flowing water through it. The main use of the water flow is to create a small amount of agitation and keep the water in the tank well mixed. The basic performance information we supply takes into account that some folks will not test their results - we therefore quote what we consider to be conservative numbers. The washer can be used at flows as low as .25-.3 GPM (1-1.5 liters/min.) and can get good results in 20 minutes. Secondly, the most important elements to water use and wash time have to do with the water itself (the temperature and pH) and what you have done to the print before it gets to the washer. Pulling a print out of the fixer and placing it straight into the washer is the worst possible case. Rinse the print off in a tray of water first. Better yet use adequate hypo clearing treatment with a rinse beforehand. Then, if water use is critical where you live use rapid fix. The savings in water use from best to worst case can be as high as six to one! Lastly, is water use really a problem where you live? We ourselves hate to see water wasted, but the water used for print washing by most photographers is a tiny amount of the water use of their household, and costs very little. A more important priority is making sure that the prints are washed, and that you don't spend more money on the washer (and its maintenance) than the water is worth.